Happy Friday Faves! This meme is hosted by Susanne over at Living to Tell the Story. It's a good reminder/encouragement to look back over the past week and list things you are grateful for. I'm going to spin-off a bit and do something a little different this week . . .
To be fair, a lot of these states were visited on a cross-country road trip (mentioned in my Bound for Oregon post earlier this week) and, in most cases, did not involve thorough explorations. (I moved from Texas, where I grew up, to Idaho and decided to do a huge road trip to get me there. I moved via going through the Southern states, over to Florida, up the East Coast and across the country on to Idaho!) A friend came along with me and that was quite the memorable trip! We tried to make special stops and explore a few things in particular states. This trip definitely gave us a broader appreciation for the diversity in landscape and culture around our country, that's for sure! On a different trip, I also once flew to Maryland to travel with some friends by car up to Prince Edward Island which allowed me to see a good bit of the East Coast. What a fun trip full of FANTASTIC memories! 1. Oregon. Oregon is my final stop. (I hope anyway.) Maybe I should hold that loosely and say, "It is my latest stop." (Who can know the mind of God? I never expected to live in Idaho of all places!) WARNING: AVERT YOUR EYES IF YOU LIVE IN TEXAS. I grew up in South Texas where it is HOT, BROWN and UGLY! (If you like the beach then you're probably good to go but I don't like hot beaches so there you have it. I don't like being hot period.) I remember when I visited Prince Edward Island I thought it was the most beautiful place on earth. (Not that I was biased or anything!) I longed to live some place wet and green. As you might suspect, Oregon fits the bill quite nicely! I love the rain, I love the cool air, I love the valleys and mountains and even the freezing cold beaches! I love the trees, the flowers, the produce, the beauty that is this state. 2. Maine. On our road trip to PEI we stayed for a day/night in Maine and I thought the state was (FREEZING cold) and absolutely beautiful. We were on our way to PEI so our stay there was brief but I loved the backwoods feel to the place . . . the country-ish roads surrounded by trees. We stayed in a bed & breakfast that was like a little cabin and it was so homey and inviting. (And did I mention freezing? I don't think the place had heat, actually.) I've always wanted to go back. With an electric blanket. 3. Maryland. My best friend in law school lived in Maryland and I made a good number of trips out to see her. I like Maryland because it is so full of history and so close to history, without being too crowded. My friend lived about an hour away from anything you could possibly want to see which was great. But most of my love of the state probably comes as a result of love of friendship. I have a favorite house there, with a favorite living room where we would talk and laugh and eat Chick fil A in. It's a pretty state and I've enjoyed it every time I've been. 5. Idaho. Yup, Idaho. I love that state. I love the small towns, the close communities, the snow, the wide open spaces and GORGEOUS blue skies that you can reach up and touch. That state has the most serene feel to it that I've ever experienced. It's so spread out and huge and people love to be outdoors whenever possible. If I couldn't live in Oregon, my next pick would be Idaho. Yes, it gets cold but I'm something of a cold weather type of girl so this didn't bother me at all! Moving there was definitely a surprise, but it was one of the best surprises of my life! Furthermore, it got me in the position of being close to Oregon and mutual friends who would eventually introduce me to my husband, Jonathan. Idaho was a fantastic stop over and I loved it. 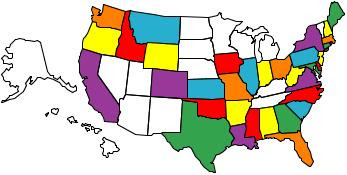 Want to play the "States Game" and tell me what your five favorite states are? Again, here's the link to the map of the states. In the meantime, I hope you all have a fantastic weekend! Your travelogue was so interesting, Carrie! I would say you are a very adventurous traveler. I'm afraid I'm rather boring. I live in South Carolina where I was born and raised and I am a Southern girl at heart. If I couldn't live in SC my top picks would be: North Carolina, Tennessee, Kentucky, or Virginia. My fifth favorite, where I wouldn't want to live but where I do love to visit, is Michigan, where my dad was born and raised. Fun map and post! You've inspired me to write a similar post on my blog. Carrie, I would love to see some of Oregon and Idaho! I think our land is filled with unique places and when I have time, traveling to each state is what I'd like to do. I'm with you, I don't like hot places. I'm originally from Florida and now live in the midwest. Mary Bailey - haha! I actually HATE to travel now. I did all of that when I was single. Now the idea of packing up three small children and driving two hours away seems like enough. (Some times even 45 min. seems like overkill!) One day, when the kids are older, I expect it won't feel like such a big deal and I will be up for going further and doing more but at the moment - that just sounds EXHAUSTING! What a cute post! The only state of those five that I have visited is Colorado, and I agree that it is beautiful. Maybe one day I'll visit the others. My map would look a bit colored on the East Coast...and then just California (for a family wedding). I would really like to explore some of the mid-west, though the rain in Oregon just doesn't sound appealing to me...though a visit does!! Until my senior year of high school I had only been to PA and NY. I think. I grew up in Southern Oregon, moved to Seattle and now live in Reno, Nevada. Going from Seattle to Reno was such a BIG change. I loved the rain but after 20 years of grey skies I gotta say the sunshine is great. The best thing about living in Oregon is the going to Powell's Books in Portland. If you haven't been it's a book lovers paradise!! When we travel we always hit the bookshops like some folks hit restaurants. That's how we mark our travels. The only state on your list that I've visited is Colorado. But the rest are on my list of top places to visit! I'm in Arizona and it is dull, brown, and hot. ;) I hate the weather here most of the year, but we have the loveliest winters! Everyone else is freezing while we experience 50 degree days. I hope to visit Oregon soon! Did I know you lived in ID? I don't remember. My husband is from ID -- well, they moved there when he was in his early teens, I think. We've always wanted to visit Maine. I grew up in southern TX -- in Corpus Christi til I was 13. It was a pretty city an I loved Padre Island then. Very hot, though. Fun Carrie! Where our maps don't overlap they are almost exactly opposite! I have been to every state you haven't except for 2. And in total I've been to 25 I think. Favorites... definitely Oregon and Washington. Then Montana or Wyoming. possibly Colorado too. I'm a western girl at heart! Did I tell you we're going to Baltimore in June? I'm sure I did, but we just finally actually got our tickets this week so it's for sure! I can't wait to visit DC and things back there as I've never been! And Cassandra, I actually liked Arizona! ;) Just maybe not well enough to live there! Love this "visited states map" idea! I sent the link to one of my sons, who I know will love it. Some of your favorites are states I have never set foot in. You got me thinking with this post! I'm afraid my map would not be very colorful at all. This Canadian has been to Hawaii, Idaho and a brief day jaunt from Idaho to Spokane and passed through a bit of Montana. And that would be it for me. I'd love to take a year and just travel all over the States. On my to do list is definitely the Grand Canyon and Yosemite! Carrie, I'm a native Oregonian so I love this shout-out for my homeland! But after living in Southeast Asia for a dozen years, coming home to rain and grey and cold was just too hard on my sun softened body. So we migrated south to CA where we see the sun 360 days a year. Even so, I LOVE Oregon where all my ancestors and relatives still dwell. I'll think about doing this states challenge--I've visited 47 states! Oh, I've always wanted to go to Oregon or Washington... even California! The west has some incredible vistas. I'm from Massachusetts and I used to spend a few weeks every summer in Maine (Acadia, Northeast Harbor to be precise). Maine is my favorite state, especially the coast. There's nothing like cold salt air and endless pine-coated islands of the Maine! I have never been to MD, ID, or ME, and just had a short stint in OR, but I grew up in CO! Woo-hoo! I know most people wouldn't list Iowa, but I do love it here. I don't care for the insanely long winters, or being far from family, but Iowa has its own beauty, and we also love small town life.